Today’s interviewee is Rolf Potts. Rolf is a successful travel writer, with credits in top magazines such as Conde Nast Traveler, National Geographic Traveler, Outside, etc. He is creator and editor of Vagabonding.com, author of Vagabonding: An Uncommon Guide to the Art of Long-Term World Travel, and has a column called Traveling Light at Yahoo! News. Hi Rolf and welcome to My Year of Getting Published. So glad you were able to find time in your hectic schedule to talk with us. Did you always want to be a writer ? How did you get started writing? My writing aspirations can be traced back to about age 13, when I started writing horror stories in the style of Stephen King. This horror-writing phase didn't last long, but it helped winnow the creative urge, and familiarize me with the basics of putting a prose narrative together. Later I became involved with my high school newspaper, and I wrote a humor column for my campus newspaper in college. After college, I traveled the United States for eight months, living out of a VW van. Fancying myself a kind of new Jack Kerouac, I tried to write a book about this travel experience, but that ultimately failed when I couldn't interest any agents or editors. Out of money and not sure what to do next, I went to Korea to teach English for a couple years. What do you consider your first "break" as a travel writer? In Korea, I learned how to live within another culture, and I became a more seasoned, instinctive traveler. I also learned from the shortcomings of my failed USA travel book, and sharpened my writing, keeping in mind the narrative needs of my readers. During my second year in Korea, I rewrote one of my USA book chapters (about Las Vegas) and sold it to Salon.com's travel section. Encouraged by this small success, I strengthened my relationship with my Salon editor by writing some travel stories about Korea. He published about five of them. At this point, I'd saved a lot of money from teaching, and I'd planned on traveling through Asia and Europe for over a year. Since I had an editorial contact at Salon, I decided to pitch him with a travel column idea. He wasn't sure about this idea at first, so I hit the road on my trip and continued to write stories. It just so happened that Leonardo DiCaprio was shooting the travel-oriented movie "The Beach" in Thailand, so I decided to try and sneak onto the set of the movie as an experiment about the motivations and idiosyncrasies of travel. My attempt to sneak onto the movie set failed, but the resulting story, "Storming The Beach", made the cover of Salon and landed in the 2000 edition of The Best American Travel Writing. I got the travel column at Salon, and that turned out to be a big turning point in my career, as it raised my exposure one-hundred-fold. Editors of glossy magazines like Conde Nast Traveler invited me to write for them, and I've been freelancing for various travel venues -- National Geographic Traveler, Outside, Slate, Islands, the San Francisco Chronicle, etc. -- ever since. Travel a lot. Read a lot. Write a lot. Unless you're obsessively well-traveled, well-read, and committed to developing your narrative voice, you're going to get out-written by people who are willing to concentrate on these things. Rarely do people become professional travel writers before they have done lots of travel on their own dime - so be prepared to do that. One great way to do this is to live overseas for awhile. Get a job as a stringer or an English teacher or a bartender and experience a culture at gut level for awhile. It will make a huge difference in how you perceive and experience other cultures. It also helps to find an area of expertise. An area of expertise might be a physical area, such as Southeast Asia or Scandinavia, or the Rocky Mountains; or it may be a travel specialty, such as extreme sports, or golf, or low-budget travel, or spa travel. Keep in mind it will take you a long time to accumulate expertise -- but you'll have fun doing it. With enough expertise, you may be able to write for (or create) guidebooks, and you can do lots of freelancing on the side. At the end of the day, though - and I'm sure this holds true for all kinds of journalism - how well you write will make or break you. You can have the wildest adventures on earth, or understand a culture through and through, but unless you can write well, your career isn't going to go anywhere. What is your biggest challenge in the research and writing process? I'm a slow writer and a somewhat obsessive researcher, so often the biggest challenge is knowing when to stop researching and start writing. Research can often be an excuse for procrastination. Another challenge of the writing process is focus, the process of sitting down and actually putting in the time to get the work done. On the road, distraction and spontaneity are good things, but at your desk you have to stay disciplined, not let yourself get distracted, and get your work done even if it's not always fun. 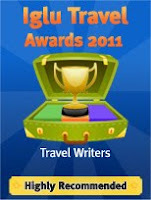 What do you see as the future for travel writers in the printed media and online ? I think printed media won't change a whole lot, though of late I've noticed print venues are skewing their coverage to service-oriented topics instead of experiential ones. Online travel media will continue to be dynamic and experimental -- for instance, now there seems to be a big demand for video, because of YouTube, though I'm not sure how long that will last (and that doesn't really count as writing). So online travel media will probably always be distinguished by length -- that is, short length -- since the web reader has a shorter attention span than a person with a magazine or newspaper in their hands. Finally, where is your favourite place and why? This is tough, since I love so many places, including much of the American West, even if it's not exotic per se. I like Laos, even though I've caught cholera and dysentery there. 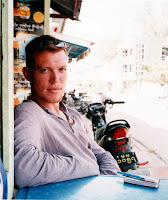 My best adventure there was buying a local fishing boat and driving it 900 miles down the Mekong -- and I think what makes you fall in love with a place is invariably tied into the adventures you have there. I also love Mongolia and Patagonia -- both for the wonder of their landscape. I love Paris and New York or their beauty and urban energy and sense of possibility. There are great aspects of any place you visit. Thanks for doing this; I'm learning a lot. Everyone, it seems, is happy to tell their story. Holy Crap, Liz! What a snag! I love Rolf. In fact, I've been thinking about going to Paris (during his summer workshop) and stalking him. He is one of the reasons why I wanted to become a travel writer. I agree with you, Sheila. I can't believe I'm in this class of people. I keep looking around expecting someone to ask me to leave. I just love Rolf's writing. Thanks Rolf for taking the time, and thanks Liz for making it available. Terah - I feel the same way, like this isn't real. Hi Shannon, it's great we all can learn from each other. If you're passionate about travel ,would like to write about your experiences and gain some experience as a writer then I would love to hear from you with samples of your work-online or in print. Even if you are unpublished , I welcome your interest and ideas for stories. Currently all writing positions are unpaid. I am looking at the moment at stories of travel experiences within Europe, especially if you were travelling on a budget. My background is as a publisher -aim is to soon launch a print version of the blog. I am keen to hear from people who have travel experiences in Eastern Europe and also visited places off the beaten track. I am currently shifting through some work sent through so please be patient while responding to you.